The Trapper (American Farmhouse Ale) -- Brew Day ~ Spotted Dog Brewing Co. The saisons that I've been brewing recently have fallen into two categories: either huge dry-hop monsters or with brett added at fermentation or bottling. These techniques have always resulted in great beers, but none of them have had the really great peppery characteristics of a "more traditional" saison. I recently tried a few glasses of Goose Island Sophie on draft and I really loved its soft, fluffy character. Although this beer is dosed to B. bruxellensis, enough of the base beer shines through to truly get a sense of its flavors. According to the GI website, Sophie is hopped with Amarillo and is aged in white wine barrels. 7/1/2014 -- Brewed by myself. 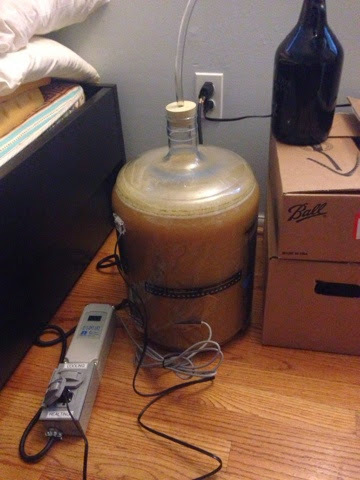 Mash pH came in a touch high at 5.5 so I dropped some acid (chuckle) to get it to 5.3. I really like a bit of tartness in my saisons and some of this is contributed by the mash pH. Gathered 8 gallons of 1.041 wort for a 72% efficiency, right on target. Ended up with 5.5gal of 1.056 wort. A few points off, but I was a little low on the mash efficiency. My fermwrap has been hooked up and set to 72 on the second day. 7/7/2014 -- Added 0.5oz of Chardonnay-soaked medium toast French oak cubes. Gravity down to 1.009. Looks like I avoided the dreaded 3724 stall out. 7/15/2014 -- Gravity dropped down to 1.007. Nice subtle complexity from the wood, not a ton of the spiciness that you get from a well-fermented saison with this yeast. Going to keep it on the wood for a bit longer. 8/3/2014 -- Finished at 1.008. Just a touch high. Bottled with 5.1oz of corn sugar for 2.7vol CO2. Taste was pretty good, with the chardonnay coming through quite strong on the finish. Hard to detect a lot of wood at this point.